EDIT: the below is due to me recently installing the STIX fonts, which came with an installation of texlive-full. This question is now concerned with how to avoid rendering the aesthetically inferior fonts. What's going on here? Why this change? I know that it is inconsequential to the mathematics concerned, but I think that it is aesthetically inferior. As suggested by Post No Bills, it appears you have installed the STIX fonts, and MathJax will use local STIX fonts before its web-based fonts (since that is faster). There are two ways to prevent this. Install the MathJax TeX fonts locally (these will be used in preference to local STIX fonts). You will need to download them individually, as we don't have them packaged for distribution directly. Open the browser console window and type MathJax.Menu.showFontMenu(true) in the command line. This should make the MathJax contextual menu include a new "Font Preferences" menu in the "Math Settings" submenu. Select "TeX (web)" from this menu to force the use of the MathJax web fonts. Note that the page will reload when you change this setting. This setting is sticky, so should be in force for a year (on the site where you set it). The font menu will not reappear after the page is reloaded (you will have to issue the command again if you want to change the setting again). Either should resolve the issue for you. 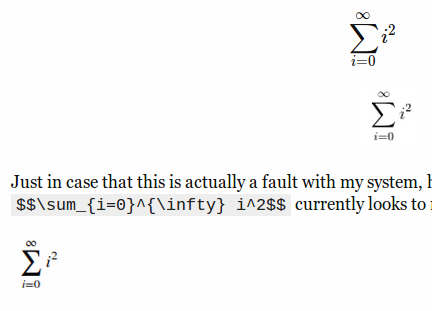 Strange LaTeX fonts in OS/X Lion? Rendering a beautiful square root with MathJax. How to change the default MathJax renderer on Math.SE?